Much of Peru’s coast is arid desert, but many of its valleys are watered by glacial rivers and streams flowing down the western slopes of the Andes. These valleys between the coast and the mountains nurtured the earliest human settlements in Peru and South America. Other cultures flourished in the Andean highlands and in the Amazon. Norte Chico (Caral-Supe, El Paraíso, Chavín, Paracas, Moche, Nazca, Tiahuanaco, Wari, Chimú, Inca. There are also the longstanding cultural groups (that did not form states but sometimes overlapped with them), the two main groups being the Quechua and Aymara as well as countless other smaller groups. Many developments which are attributed to the Inca Empire in areas such as agricultural technology, weaving, pottery, gold and silver work can actually be traced to previous cultures. Before the Inca Empire became an empire, they migrated into the fertile Cusco Valley. Manco Capac became the first Inca king sometime in the 11th century. But it wasn’t until 1438, under the reign of Pachacutec, that the empire began to expand on a larger scale with new areas incorporated through conquest, coercion, or alliance. Machu Picchu was constructed in 1450 as a royal estate for Pachacutec and his lineage. By 1500, the Tahuantinsuyo stretched north to present-day Ecuador near Quito, west to the Pacific, east to the Amazon, and south to Chile near Santiago. An extensive road network called the Qhaqaq Ñan (Royal Road) enabled communication and distribution of resources. The Sapa Inca was revered as the son of the Sun, the highest divinity. Conquered peoples were obligated to provide labor and tribute to the imperial capital in Cusco. This, along with a civil war of succession between the brothers Huascar and Atahualpa, formed the context that greeted the arrival of Spanish conquistadores to the shores of Peru in the 1530s. Beginning in 1532, Spanish soldiers under the command of Francisco Pizarro landed in Peru with the intent to conquer an empire rich in gold and silver, in much the same way Hernan Cortes had toppled the Aztec Empire (1519-21). Pizarro devised the capture of Atahualpa in Cajamarcain 1532, and then executed the Inca king. 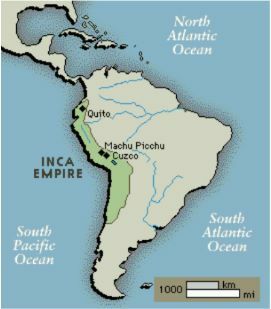 Spanish troops finally arrived in Cusco in November 1533 and installed Manco Inca Yupanqui (son of Huayna Capac) as the new puppet ruler. In 1535, Pizarro founded the city of Lima as the capital of his newly conquered territories. In Cusco, Manco Inca escaped and organized a siege of Cusco which lasted several months but was ultimately unsuccessful. After a winning an important defensive battle in Ollantaytambo in 1537, Manco Inca retreated to the outpost of Vilcabamba deep in the jungle where the neo-Inca state remained until 1572. In 1541, Pizarro was assassinated in Lima by his former associate Diego Almagro. In 1542, Spain created the Viceroyalty of Peru, comprising most of South America except Brazil. Peru’s indigenous population declined drastically during the early period of colonization as a result of European disease epidemics. They were also subjected to religious evangelization efforts and the labor demands of a small, newly established class of European landowners. In 1569, the viceroy Francisco Toledo arrived to administer the colonies. He instituted wide-ranging reforms that streamlined the exploitation of non-landowning indigenous people for the next two hundred years. In the 1700s, the Bourbon reforms sought to restore and bolster power to the Spanish Crown at the expense of native-born creole elites. But the effect was to fuel the movements for independence across the Spanish colonies. From 1808 to 1822, Spanish America fought for its independence from the Crown. 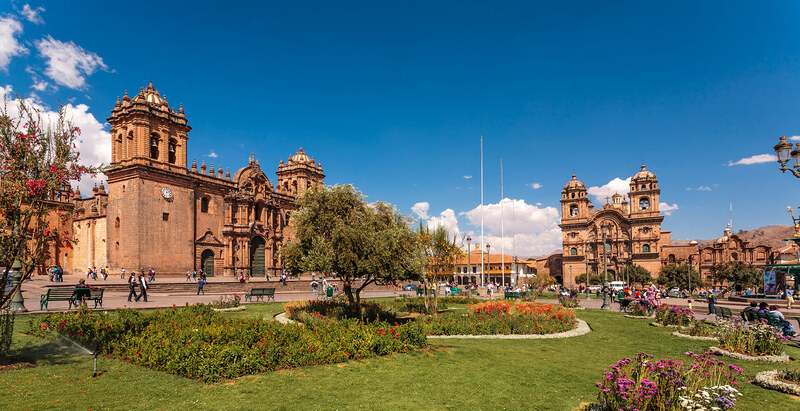 In Peru, small-scale revolts had begun decades earlier, for example during the Tupac Amaru Rebellion in 1780-81 which was crushed and ended with the brutal execution oF Jose Condorcanqui and his family on the Plaza de Armas in Cusco. In 1820, the Argentine general Jose de San Martin landed in Peru in Paracas Bay. Peru finally gained its independence on July 28, 1821. For the vast majority of Peru’s people, independence brought few changes. Political and economic positions of power were still monopolized by a minority of Spanish descended elite. Slavery was not abolished until 1845, as part of the reforms instituted by president Ramon Castilla, which also included the construction of a railway system. Additionally, guano exports revived the city’s coffers and provided funds for the construction of public buildings, markets, hospitals, and prisons. In 1873, Peru became involved in the War of the Pacific with Chile and Bolivia, each of which claimed nitrate-rich lands in the northern Atacama desert. The war ended in 1883, but not after Chilean troops invaded and occupied the capital city of Lima. At the turn of the 20th century, Lima enjoyed another period of wealth and prosperity. Lima’s most iconic buildings were constructed during this time, often in an ostentatious, neoclassical style that mimicked the early colonial period. Big avenues were constructed to connect to coastal settlements such as Miraflores and Barranco. At mid-20th century, Peru was embroiled in political and economic tumult with alternating periods of democratic regimes and military dictatorships. This was also a period of rural-to-urban migration mainly to Lima resulting in a demographic explosion concentrated in the capital. Other major cities such as Arequipa and Cusco also expanded during this time. In 1990, Alberto Fujimori was elected president partly as a reaction against decades of political corruption and the rise of violent guerrilla movements like Shining Path (Sendero Luminoso). The leader of Shining Path, Abimael Guzman, was captured in 1992. Although many Peruvians perceived that the president’s wide-ranging neoliberal reforms ushered in a period of stability, Fujimori fled to Japan in 2000 to escape charges of bribery and human rights violations. He was later extradited and sentenced to prison. Inthe 21st century, Peru has enjoyed a long period of political and economic stability. In 2015, the population of Peru is estimated at 31.2 million. Approximately 30% of this population (or 9.7 million) resides in the capital city of Lima. Machu Picchu has no close rivals as the top destination in Peru. However, in recent years, Peruvian gastronomy has garnered tremendous international attention. For many travelers today, sampling Peruvian cuisine is one of the essential “musts” on a trip to Peru.